Most of the PC card games you play are probably limited to the Solitaire, Hearts of FreeCell that come bundled with Windows, so why not spice it up by playing some poker with PokerTH instead? PokerTH makes it really easy. 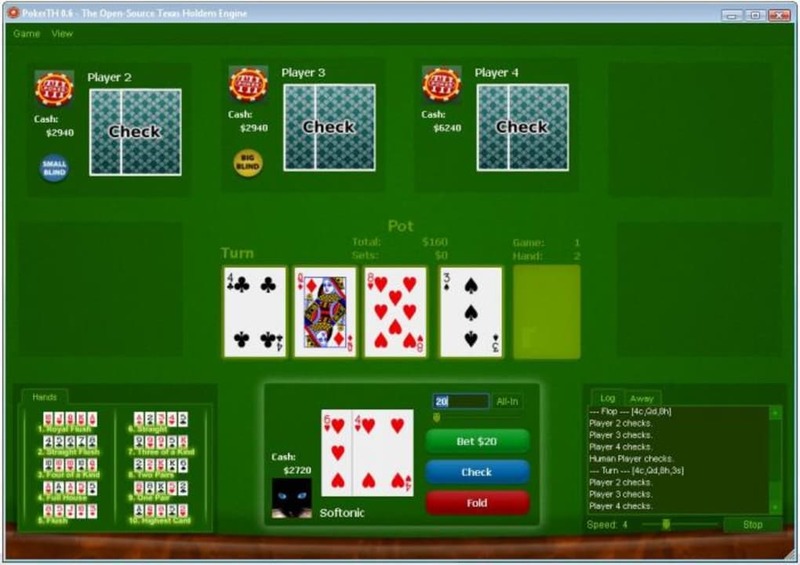 This virtual card game enables you to play poker in its Texas Hold'em variety, one of the most popular poker-based card games in casinos and poker rooms worldwide. PokerTH's appearance and behavior are similar to other card games so you'll be playing in no time. You can play against up to six opponents, all of them controlled by the computer. If you want to face real human players you'll have to play a network game, either in LAN or via the Internet. Unfortunately the PokerTH poker server didn't seem to respond during our tests, so I couldn’t' test online games properly. In any case my guess here is that the router at the office is configured in such a way that I can't access poker servers from work – I don't understand why. 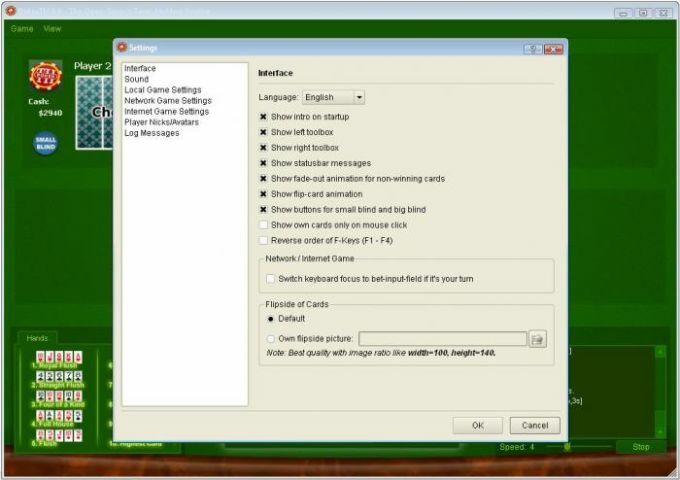 PokerTH features a very complete settings menu that allows you to configure and customize PokerTH any way you want. The only thing missing is having some background casino music, but you can fix that with your own MP3 collection. PokerTH is a free Texas Hold'em poker game with which you can play poker against the computer, on LAN or via the Internet – that is, if your router is properly configured. Auto-check/fold and Auto-check/call-any options for temporary away situations. One of the Two best Free Poker Games out there.... I have been watching PokerTH since version .3, and it has come a long way. 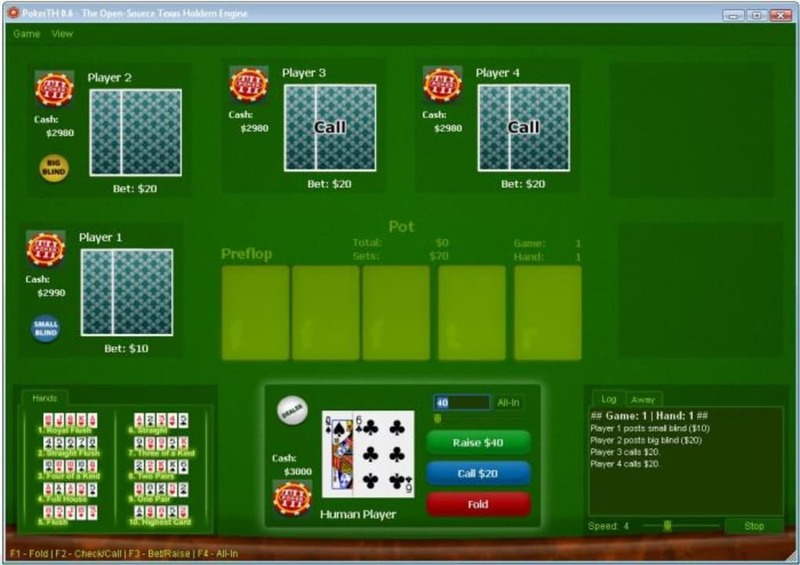 It features single computer play, network play, and online play. I tested version .7.1 for days on windows and Linux. The computer opponents are moderately tough, but if you learn to bet according to their style of play I can win about 75% of the games. Network play experienced no problems ever in either windows or Linux (one computer was windows, one Linux). I never even experienced lags or drops downloading a Linux Mint torrent in the background, but I assume if I really taxed it may have developed problems, but that would be my foolishness and not really the fault of the network programming. Online play works and works well. There seemed to be a lot of people that like to go all in on the first hand for tournament style play, but aside from pushy fools there were no other issues. This will be remedied soon since they are going to implement a rating system in version 8. - Nice user interface, with keyboard shortcuts. - Network and Internet play. In local play, many time's wrong winner. 2 pairs beat full house. I don't play on line and never with money with this game because there are many folds in it. Many time's one pair is winner over the full house and that is not correct. What do you think about PokerTH? Do you recommend it? Why?